and get your songwriting the respect it deserves! My name is Dainis W. Michel, and I'll tell you more about me below, but for now, please allow me to start by telling you that I believe in giving. And, when you give, it comes back to you even more. That's why, in the course of this page, I will be giving away high-quality information that most people would charge for, and you will gain insights just by reading this eBook sales page. In this letter, you will find some of my top suggestions on how you can effortlessly supercharge your creative potential through my music notation learning system. I'm going to outline the basics of my teaching method in this webpage for free...AND...at the bottom of this page, you can sign up for my Free Report called "Unleash the Awesome Songwriting Genius in You...NOW!" available to my newsletter subscribers. In this day and age, everyone's busy and time is of the essence, so here's who I'm talking to here, and who I'm NOT talking to. You're just starting with songwriting and you want to learn the ropes. You're a prolific songwriter who hasn't fully explored the advantages that music notation provides. Your lack of knowledge has gotten you into some embarrassing situations and some tight spots musically. You may have even relied on others to notate for you. You're struggling to get your songs out of you. You never feel quite right about your songs. Maybe you don't play the rhythms right or what you can play just doesn't match how cool the music is in you head. You're a pretty decent songwriter and know a thing or two about music theory. You can create a lead-sheet, but would like to be more proficient at doing so. You'd like to move on to making arrangements for other instruments and want a highly effective system for recognizing and writing out notes as easily as you can imagine them. You teach music (aural skills, a musical instrument, composition, theory, etc. ), and you recognize the benefits of reading and writing music. You wish to bring joy and ease to the process of music notation. ...glad to have you...let's continue! Watch this short video for a rundown on why writing your songs down is the gateway to unleashing your songwriting genius. I totally know where you're coming from...I went through the same thing. I felt the hunger to become a competent, skilled musician, and I practically leapt over tall buildings to do so (I'd say working 3 jobs while going to grad school full time qualifies as leaping over tall buildings), and now, I can pass that knowledge on to you in a clear, fun, easy to digest and apply eBook. It just wasn't honest to consider the educated musicians to be pompous, arrogant, know-it-alls...they KNOW something...I mean jamming with them was incredible. They'd just cruise from gig to gig, subbing here and there, getting paid all the time, and I was on the sidelines. Now, instead of being on the sidelines, I get sought out to help budding musicians. Just listen to this audio snippet from an interview for a radio station in Vienna, Austria, where I live now. The guy actually sought me out! I want you to experience that same joy...in your own way...and I want to make it easy for you. This eBook gives you the key information you've been lacking to fulfill your desire of becoming a competent, prolific, and creatively free songwriter. Don't get me wrong, for a lot of people, it's a big shift to move towards musical competence. It can be really scary to admit what you know and what you don't know -- you can feel totally naked and exposed. That's why the eBook format is totally comfortable. It's private, it's easy, and it gets you results fast. I believe in your inner genius. Frankly, I recommend abandoning any teacher who doesn't. I highly recommend sharing the methods in this eBook with your teachers and finding out what they think. Ask them to monitor your progress. They might be hesitant at first, but when they see the results, they'll be so thrilled! I can't wait...seriously...I just can't wait! Now, you might think, "who is this guy, and how can he say he believes in my inner genius...he doesn't even know me!?!" I understand that objection, makes sense. It might explain things better, if I said, "I believe in everyone's inner genius," and I deeply and profoundly do. I also recognize that some people walk around disconnected from their "inner genius." They may or may not even feel it or know it, but on some level, it hurts. That's why it's so important to me to help people gain greater access to their own creativity in songwriting. Moving from "songwriter" to "composer"
...now that's exactly what I wanted, what I achieved, and what I've put together for you in the eBook "How to Write YOUR Songs Down!" Frankly, I actually feel sorry for songwriters who do not know how to write their songs down. And, yes, that means I feel sorry for Paul McCartney and every other popstar who can't read or write music. Paul, bless his kind soul, seems embarrassed when the subject of reading music comes up ("...do you have to mention it in front of all these people?"). I hope you'll understand that I feel sorry for him in a good way, though, because I deeply understand the troubles that "by ear" musicians have with writing and reading music. I faced intense struggles with reading and writing music, and I never understood why it was so much easier for me to play my own music than read and play the music of others. In a sense, Paul is right...it's not "necessary" to know how to notate music before "authoring" songs, but it's also not necessary to know the rules of the road before driving, it's not necessary to get dressed before going outside, it's not necessary to unwrap your sandwich before eating it. I mean, a lot of things aren't necessary, but they are incredibly helpful. They are useful. They are powerful...and frankly...they are "better." And that's when I start cringing...it's when I imagine just how awesome Paul's music would be, were he musically literate. Another person comes to mind, and that's Freddy Mercury. Yeah, he was partially musically literate, but my mind just starts soaring when I think of what artists like that could do, if they tapped into their full artistic potential through learning the written language of music. "So, I sugggest that formal training in music has nothing to do with the quality of a piece of music. Some musicians got together one day and invented rock 'n roll, and they did not have to present diplomas from Juilliard to do it. The symphonic form or lack thereof has nothing to do with the quality of a piece." "Sappy, wordless music performed by an orchestra does NOT a classical piece make. Paul McCartney has no idea of what constitutes serious "classical" music. He doesn't understand orchestration or use of time or timbre. I always get a kick out of pop stars who have never studied music, nor can they read, write or understand musical composition, but still believe that they're qualified to write serious music. Even with the Beatles, it was the more musically astute George Martin who arranged the strings on Eleanor Rigby and others. Paul couldn't tell the difference between a French horn and a tuba. Standing Stone sounds like bad elevator music -- good for a soundtrack to a movie, sort of like "The Family Way" music that Paul put together in the 60's. The melodies are trite and the orchestration lacks depth. If one does not understand how composition works, one's music can only have so musical depth." "Strip away the various ghostwriters and what would you get? Probably very little, but at least not this soulless mish-mash. (Let's reconsider this remark: "Gershwin's endlessly inventive piano take-offs of his hit tunes come to mind as examples of a composer who took his own hit tunes and did something fresh with them." Note please that George Gershwin arranged these HIMSELF. Note please that George Gershwin PLAYED these himself. I see no basis for comparison with the Paul McCartney pop song arrangements included here whatsoever...)"
So, there you have it. If you read between the lines, you know what's going on, don't you? It's not that the educated pros are jealous of Paul, it's that truly, Paul has no right to call the compositions "his," because he didn't compose them himself. Sure, he might have come up with the melodies and made comments on the form and orchestration, but he had to rely on others to write everything but the most basic aspects of the music. So, some people might like the orchestral music that Paul, let's say, "project managed," but he is only legally the composer of it, with the real composers and arrangers on staff, behind the scenes, in a "works for hire" capacity. You might feel deep sympathy for Paul, as I do, and you may not ever want to write orchestral music, or even write arrangements of your music. You might be "just fine" with "just jamming," and I completely support your decision, if that's what you choose. It's just that, in making that decision, you miss out on all of the advantages of musical literacy I've outlined on this page...you miss out on the POWER of creating the musical blueprint of your very own songs...and these are YOUR songs. For me, each song is like a baby. Like a child you love and nurture and care for and bring to maturity. Writing a song down gives the song the dignity, the love, and the honor it deserves. It allows you to nurture the song and bring it to maturity...as if you were caring for your own child. Grab a sheet of staff paper and a pencil, and shape your songs to perfection! I understand how tempting it is to just accept not being able to read or write music, and that it's easy to let people say how cool and creative you are despite your lack in "knowledge." Yeah, yeah, you're a "natural," the music just flows out of you, it's just not necessary for you to be able to read or write music...but somewhere inside...it still just feels crappy being musically illiterate! It feels crappy being musically illiterate as a "composer"
...need I go on...it just feels crappy being musically illiterate! Been there, done that, so if you're in that situation, please, don't just buy my eBook, but buy my eBook and get in touch with me via my contact form. The suffering can end now. I've made it easy, accessible and fun. And I'm certainly not saying that you "need" this knowledge or this eBook, if you want to create "some kind" of musical result. You'll continue to get musical results with or without this eBook. You'll likely coninue to record, to perform, and please audiences, but somewhere inside, all of us know just how powerful writing music down really is...don't we? For songwriting...it's like driving a Ferarri vs. a Yugo! (Remember that little car? ), it's like riding a thoroughbred vs. a donkey, it's like a diamond vs. a lump of coal, it's like going from being a scrawny weakling to being a muscle-bound superstar, it's like going from being in debt and not being able to afford a sandwich for lunch...to being a millionaire and being able to eat and buy whatever you want! It just feels great! Do you want to feel that way? I did, and now I do -- every single day! That's what I'm inviting you to try, risk free, by buying my eBook. If you don't feel the wonderful creative surge that the increasing competence in music notation gives you, simply return the eBook no questions asked. Don't need to freak out if your big hit song idea comes to you, and all you have is a scrap of paper and a pencil. Don't need to rely on playback and repeat, playback and repeat, playback and repeat to shape your music. Can actually arrange music, and not just "say" you're arranging music. The process of arranging happens on paper. Can shape your songs more effectively, because you can visually move song sections around and see what they would sound like. Can perform your songs way better, because you've not only internalized, but actually written the blueprint of the song: the sheet music. To make a long story short, I've paid my dues as a singer-songwriter. I've played bars, sororities, fraternities, conventions, outdoor gigs, etc. Although I didn't have a degree in music at the time, an album of my songs won the Albert P. Weisman Award from Columbia College in Chicago, and a song I co-wrote was selected for Champaign Underground's Best Kept Secrets Album. Despite early successes, I always had a gnawing feeling in my stomach that I needed to educate myself fully in the craft of music composition and songwriting. So I did. For a while, I was working 3 jobs to get through it, but I got my Master's Degree in Composition from Butler University in Indianapolis Indiana, and I'm now living in Vienna, Austria, where I'm getting my doctorate in "The Teaching of Music Composition." After over ten years of hard-won education, I believe my eBook can give you the missing information you need in order to unleash the awesome songwriting genius in you...now! Now, as I mentioned in my video, I'm not in any way saying that I'm more creative than you are. Not at all. I may not be more talented or gifted or even as commercially successful as you. You may not even like my music. But that is totally not the point. The point is that I have full access to my songwriting creativity due to my ability to write my songs down. The style of my musical output has nothing to do with what you can do with the tremendous power of learning how to notate your songs. Take a deep breath and just imagine being able to create the "blueprint" of your music, imagine being able to create a completely professional lead sheet and imagine handing it to a fellow musician. Feel the respect, feel the recognition, and then hear the tight, awesome, well-coordinated, and simply magical musical result you'll get once you've done the exercises in the eBook. Broken down like that, I bet it doesn't sound that hard anymore now does it? And I bet you even know a thing or two about some of the items in that list, don't you? Now you can take the bull by the horns and effortlessly learn how to notate your own music. And you know how I said I'd even teach you a few things in this letter? Well here goes. You'll learn syllable structures that make your music fly! Here are two counting methods that help you put your rhythms on rails. No one likes sloppy rhythms. With some simple structures (which I share in the eBook), you'll go way beyond these simple examples...and you'll blaze through your rhythms with hot, laser-like, tight-but-relaxed, loose-but-precise dynamic and flowing joy! I bet you can't wait...I'm so excited to be able to share this information with you! Now, a lot of people have trouble with this one, and if you've read this far, you deserve a treat. Because I used to be a crappy reader and hopelessly musically illiterate, I understand how frustrating writing and reading "dots on the page" can be. Because of that, I teach you how to use logical, easy methods like jotting down dashes on a page and then I show you step by step how to change those sketches into professional music notation. Do you think you can do something like this? I certainly think you can! You'd have to be brain dead not to be able to make dashes on a sheet of paper! Sheesh! Also, I now know that it was my talent that kept me from learning music notation...because I was just able to pick up the music by ear and sing it and play it...which basically worked for folk music, for rock music, and for every style of pop...but ...well...now I'm going to share some really embarrassing stories that you might be able to relate to. When I was asked to participate in an advanced choir for a tour in Canada, well, my poor sight-reading really caught up to me. I'd already been in just about every choir imaginable, from the Black Chorus at the University of Illinois, to the Madrigal Choir in the Chicago Childrens' Choir, to the Select International Latvian Chior called "Dudas," but when I went on that tour to Canada...well...they pulled me in as "dependable substitute" for someone that couldn't go. I came highly recommended, I auditioned, got told how much I'd be paid (which was really neat), and there were only a few rehearsals left. Honestly, I couldn't really keep up, I'd reached the end of the line regarding what my "natural" abilities could give me. I had to stay quiet and mumble through a few sections, I had to really really listen to the guy next to me, and when the conductor split the voices and asked me to sing a part alone, I just couldn't hack it. When I played with a professional guitarist, he said "oh, I like what you do with that flat nine," and the best I could do is stare at the guy. I was so embarrassed that I didn't know what that was. I figured, if I knew about the "language" of music, I'd know what he was talking about. Somewhere in the back of my mind, I remember bringing in a cello player to play some pop songs I'd written, the cellist asked for the music. When I didn't have any sheet music, I mapped out the song and told the cellist the chords. Then, I asked the cellist to improvise. While the result was OK, I felt see-through...the cellist knew that I was musically illiterate. When I wanted to write a string arrangement to a song I'd written...I just couldn't hack it. I worked with a teacher, and I actually compared what I wrote before the teacher and after. Folks, what I wrote "before" the teacher was a joke! The musicians couldn't even understand what I'd written down, the chords sounded crappy, and I just knew that I was missing the key to truly unleashing my creative musical potential. When I wanted to work with a brass ensemble...basically the same thing would have happened, had I not learned from the string ensemble experience...I didn't even know how to write out the transpositions that brass players require in order to play in the same key, and my embarrassment solidified my commitment to achieve musical literacy! As I started playing with more and more professional musicians, I noticed that the educated pros were generally doing pretty well financially, they taught lessons or were teaching at a music school, or were playing in an orchestra...or were some how otherwise employed...but they were "in-demand" as musicians, and they seemed to be able to "pick and choose" the musical projects they took part in. And I couldn't get over that they kept getting paid! I started to get angry when I realized that skill in music, that is, being an educated pro, is actually in demand and pays pretty well. It also made me angry that I'd been told the opposite while growing up, that musicians are broke, that they have no money, that they don't have jobs, etc. The breaking point for me was while I was working as an IT consultant in Chicago, and I wanted to find out how much it would cost to get some tutoring to help me study for the music GRE (Graduate Records Exam). I'd come up with the idea that maybe I could go to grad school in Music Composition and I could make up my undergrad deficiencies while doing so...well...the tutors in the Chicago area were between $30 and $110 per hour. I couldn't believe it...I was so MAD! I thought to myself, "if I had known THAT, I would have studied music from the very beginning..."
So, I started working with some teachers and was able to co-author the following arrangements. These were made in 1997/8. I'd say that Jon Novi, my teacher at the time, wrote "most" of the arrangements, and the experience allowed me to fully appreciate the POWER of achieving musical literacy. What really started getting my goat was that my teachers, and all these "other" professional and educated musicians seemed so happy. They were plugging away...even if they were working other non-music-related jobs...if they were good readers...if they were educated musicians...they were just like doot doot doot, hum de dum, play play, make money...everything is breezy, everything is okay...and I was struggling! It seemed so unfair. Why did I have to struggle with reading and writing music? I was considered a gifted and natural musician, but I was still basically musically illiterate. Frankly, I felt terrible. I didn't even want success with my music, because I felt like I hadn't honored it. These other people...the educated pros...they had honored their musical gifts and I hadn't. What a sucky feeling. Just crappy. Low. So, folks, I struggled through it. I worked 3 jobs and paid my way through grad school. I made up my undergrad deficiencies and suffered through the embarrassment of being "worse" in many areas than the younger students around me. But, through all the suffering, I started developing effective methods for learning things that some teachers say you can "only" learn, if you start as a child (which is complete nonsense, by the way). Now, I've compiled my methods in an easy to read eBook. They've been brewing inside me for years, and all I can say is...whoah, would my life at grad school have been easier had I known these methods! Would my songwriting experience when I was getting started have been easier and more enjoyable had I known these methods! Goodness! I don't even want to think about the struggle anymore, and I don't want you to have to go through it either. Seriously, I want to save you a lot of pain, pain that I went through and you don't have to, if you read my eBook and apply the simple exercises I've outlined. Instead of struggling, songwriting will be a breeze for you. If you'll let me, I will show you my "eagle-eye" method for learning to read and write music at any age. Looking back at the struggles I've had in music, I just can't understand why reading and writing notes isn't integrated into music education. With my eBook, you can benefit from possibly the most essential, but most overlooked and under-taught skill in the popular music arena: the actual writing...that is the notation...of songs. Now that I think of it, it might be the most overlooked and under-taught skill in music education. 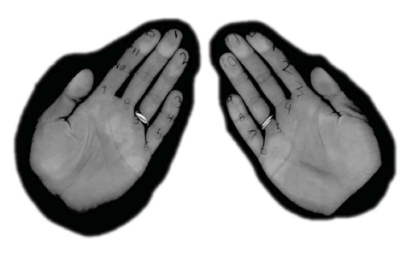 To help myself, I developed a new "Guidonian Hand," which I call the hands-o-music. You'll find that you can sing any scale, any mode, and eventually any pitch...in any order...if you stick with my new Hands-o-Music. I created a single-syllable system for each note, so instead of having only 7 syllables (which then don't really take into consideration the remaining 5 notes), or having 35 or more syllables (singing note names) -- you have a single syllable for each note, which leads to only 12 syllables. Do you think you can learn twelve, single-syllable note names? I think you can! And when you do, you'll be breezing through the songwriting process like an educated and competent songwriter should. Cool! rt aligned and a different color: Here's a tip, I actually REVEAL the syllables in my FREE report, which you can have sent to your email address right now! 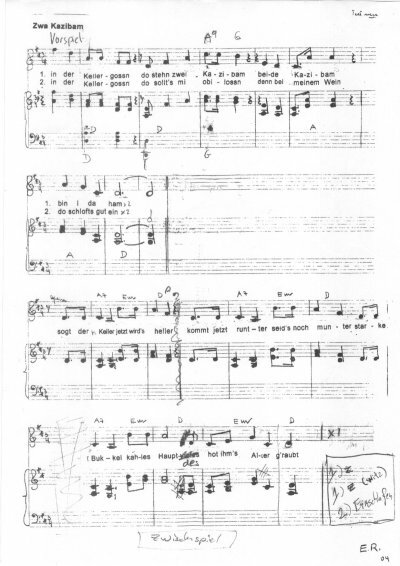 Graphic of his song called "Zwa Kazibam"
Now, that's not the most impressive sheet music, is it? No it's not...but it was enough for me and a friend of mine to perform the song at the "end of the semester concert" at the school I was teaching at. He went on to write out and record two more songs and he entered one of them into a competition. I lost touch with him around then, so I don't think he won...but the thing is...he entered, and honestly, I picture Edmund on his death bed saying to himself "Oh thank God I wrote out those three songs...thank God I brought those tunes from concepts in my mind all the way to music on paper and then a nice performance." Here is a live recording of the song. I did catch up with him about a year or so after our lessons had come to a close, and he said something like "yes, those songs and recordings have provided me and my wife so much joy." Now I don't know if that means anything to you, but it brings tears to my eyes to think that without a trusting teacher like me who would take on a 70-something year old man and really keep him to the honest-to-goodness no nonsense techniques that will bring him results...he might have passed away without that feeling of joy, without that feeling of release, without his inner genius being realized in the form of his song, and he might have even kicked himself saying "God, I wish I would have done something with my music" before passing away. Now, dying in a state of regret is something, at least in the area of composing songs, that I helped Edmund avoid. So I really mean it when I say it does not matter how old you are...if you use the techniques I outline...you WILL write out your songs, and in writing them out, you will be able to shape them to your will, others will be able to play them in ways you might never have thought possible...and yes, it will bring you immense satisfaction and joy. Do you want to die knowing that you didn't do your music justice? I didn't, and now you don't have to either. The eBook takes saves you years of struggle and replaces it with joyful, easy understanding of song notation. Doesn't that sound nice? These skills give you powerful control of your music. You'll notice that the power of music notation, the power of creating the DNA, the "blueprint" of your songs: the sheet music, is completely independent of the style of music you create. "This is one of the most complete collections of practical songwriting resources and ideas, both for creative inspiration and for a myriad of professional musical skills. Easy to access and great fun to read, these books are a must for the serious songwriter. Dainis' insight into the artist's mind is exceptional!" "...gave some great pointers...I'd recommend it to anyone starting out." Save yourself the struggle and embarrassement! Have you ever struggled through sheet music...in front of people? Well, knowing how to read and notate music are admirable skills, and for a lot of people it's really hard. But not anymore, not with my eBook. I explain things that otherwise take years to learn with a few unique diagrams. Sure, you need to learn and practice the stuff, but you barely need to do anything but add the system into your current practice routine. Sure, you might learn faster if you take the time out to practice the skills in the lessons, but actually, all you need to do is use my system while you're playing (within your current practice and playing schedule)...so besides learning the structure itself...it doesn't require any extra time. My system starts reducing your "struggle" and saves you time right away. Every musician has the right to truly free their inner genius...including YOU! Now, depending on the depth of your care for your creativity, I feel that you have an obligation to yourself and the world to share your music with everyone...in the most professional manner possible! I fully understand that it feels like a long hard road, but with this eBook, it just doesn't have to be as hard for you as it was for me. You don't have to buy tons of studio equipment just to get your ideas down. Sure, you CAN have studio equipment, but once you're using my system, frankly, you won't even need an instrument to write out your songs. You'll be able to write them out while sitting at a restaurant, a cafe, while on a mountaintop...wherever...and I've personally noticed that even when I don't have a pen or paper with me, because of my system, I REMEMBER the music I come up with throughout the day. I don't need a mini recorder, because I've simplified the musical process so much for myself that I just remember my ideas. Home studio equipment is great, don't get me wrong, but honestly, I feel sorry for the people who are going to buy a new effects processor for a few hundred bucks instead of opting for this eBook. Well, the spending of thousands of dollars on studio gear and still not being able to make music is something I know well. It accrued to my along time ago I was spending more time on how to make my gadget work then expressing myself though it. And then I realized that I really don't know music. Sure I know what notes and rhythms are, but I really didn't know music. So I decided to take a step back and fill in the gaps and I asked my self what do I want to do most. And answer was be able to take different sounds, instruments or what ever and then create something musical out of it. It seemed that composing is what interests me so I did a google search and found you eBook and here I am. I skimed though a lot of you book already, and your Hands-0-Music is really a cool idea. (you might want to consider grabbing the domain name www.hands-o-music.com). Looking back the lead sheets that [a friend] created really gounded the music he recorded. I see the importance of being able to write music down. I'd really like to learn to do this well. " Can Hardware and Software Replace Skill? Don't get me wrong, gizmos are cool. There's a lot we can do with expensive gizmos. Here's a list of gizmos a lot of songwriters have. Doing your math on hardware/software purchases vs. investment in education/skill can help you resolve imbalances in your approach to songwriting success. I'm not saying you should get rid of your equipment...love it, use it, enjoy it...but some of you may have studios worth thousands or tens of thousands of dollars if not more. Here's what I am saying: none of those things make you a better songwriter. You'll be able to take next steps and create arrangements for your songs. Things like real strings, real winds, real brass...you'll be able to do it yourself! And, you'll lay the groundwork for creating arrangements...even orchestral works...yourself. Buy the latest gizmo and in a few years you'll just have an out of date gizmo. Learn to write your songs down and you'll be following in the footsteps of the greatest composers in history. Once you've integrated the simple system I've outlined in my eBook, you're songwriting and composition process will be much clearer and much faster. Use the time you save to go to the ocean, or climb a mountain, or go scuba diving, or whatever makes your heart soar. Hmm...you could also use your extra time to send me a nice thank you note...I always enjoy reading about how my efforts have helped others. You'll save time because you'll understand the background "framework" of music the way I outline it in my eBook. Guessing comes to an end and clarity sets in. It's much faster and much more enjoyable, because you'll be working smart! Had a band and we tried real hard..."
Remember that song? The passion in the vocal delivery gets me every time, and I totally relate to the journey in the song. Look, I love that song, OK? But I unlocked something, and I want to give you the key. With this eBook, you'll stop trying so hard and start working smart! Songs and music will flow out of you so easily, you'll never ever want to go back to the old painful days of trial and error. When it all comes down to it, it's just more comfortable to be able to notate music. No more embarrassing shame when working with pros, notes just flow out onto the page from your mind to your hand, performing the music becomes so much easier, you can concentrate on delivering your best performance, and you can serve your music better, instead of being "behind" your own compositions! It's like going from being a skinny songwriting weakling to a being muscle-bound songwriting superstar! The pros and greats knew it, now you can too! And what about when you learned English? You learned how to read and write, right? It's way easier than you may think, and honestly, it boggles my mind that so few teachers treat writing music down (notating music) with the same importance that writing has in learning a language. It's such a shame to see creative, talented, musical people who are hemmed in by their lack of musical competence. Sometimes, even famous and award winning songwriters lack understanding of the craft of songwriting. Well, YOUR success does not have to depend on your lack of knowledge...come on board and learn how to write your songs down...its fun! You don't need to continue to live with the deficiency of being unable to write a professional lead sheet anymore! One of the best advantages you'll get from this eBook is earning the approval of educated and pro musicians. Most educated and pro musicians have paid their dues. They've put forth what takes to get them where they are, and they earn their keep. When you work with people on that level and give them a clean, professional lead sheet to read from, they know you mean business. They'll play better for you, and they'll give you that indescribable feeling of being respected. I spent too many years getting talked about in kind of a joking way where people would say things like: "he's so creative, but has no idea what he's doing," and I mean in a sense that's cool, they were calling me creative and all, but they were also calling me an idiot at the same time...I could see it in their eyes. I mean, I just don't want you to need to go through that anymore...or ever...and if you're a teacher looking for materials for your students, then I want to give you the fastest and easiest method for helping your students become proficient at music notation. The "creative genius, know-nothing, my songs are great, I just need the attention of the right AR rep and I'll be bigger than Hendrix" dreamers don't pull a lot of weight with educated pros. Professional, clean, readable music notation does! Some people say that an education in music makes people restricted in the way they play. They point to stiff musicians and say "that person is a stiff musician, because of knowledge." Never mind that the person might be stiff because of arthritis or stagefright...the "anti-knowledge" folks do everything they can to avoid "book learning" and feel strongly that "knowledge" would restrict their creativity. Have you met musicians like that? Have you ever been inclined to think that way? Some people who avoid knowledge are successful, to a certain extent. They can take a puny thread and magically make a whole blanket out of it. But what would happen, if that person had a workshop, tools, all kinds of colored thread, along with deep knowledge of how blankets are made? That person would be a "blanket producing superstar!" So just imagine what would happen to you and your songwriting, if you had deep knowledge of how songs are written? Sir Francis Bacon said "Knowledge is power," and with this eBook, you'll gain powerful knowledge about songwriting. Albert Einstein said "Imagination is more important than knowledge," and in this eBook, your imagination (your inner genius) is honored and given its appropriate rank. Just to make that a bit more clear, Albert Einstein was talking about priorities, he was saying that imagination is more important than knowledge, but he was not promoting "imagination without knowledge," do you see what I mean? That's where a lot of talented and creative artists go wrong. Please don't make the same mistake! So stop arguing about whether knowledge or imagination is more important, and get the benefits of both worlds with the skills outlined in "How to Write YOUR Songs Down!" What you really want, and what you're getting in this eBook, is the kind of structure and easy-to-learn knowledge that you can apply immediately to free your true voice and let your imagination soar. I want you to unleash the awesome songwriting genius in you...NOW! Albert Einstein also said: "Any intelligent fool can make things bigger, more complex, and more violent. It takes a touch of genius -- and a lot of courage -- to move in the opposite direction." And that's exactly what you'll do with this eBook! While learning the information in this eBook, you will literally feel the your understanding of music and songwriting become deeper. Music will become crystal clear, and your songwriting process will become simpler. You'll feel great about yourself and your dedication to your music. You'll be honoring yourself and your creative genius, and you'll actually "feel" yourself gaining a "razor's edge" understanding of music that will separate you from the rest of the pack. Remeber when I told you about being sought out to help others with their songwriting? If you listened to the radio program snippet above, a Nigerian poet sought me out because an Austrian songwriter had written and recorded a song to one of his poems. The only problem was that the rhythms weren't OK, and the songwriting itself lacked awareness of song form. With kind permission, he's allowed me to summarize his progress in an audio file. There's a night and day difference, isn't there? I mean sure, there are a few extra instruments, but I'm talking about the song itself. We went through some of my exercises and were able to accomplish that much after a few sessions! And honestly, he's hardly through the system...just think of what these methods will do for you! The style of music you play doesn't matter in this particular learning process. This knowledge enhances all songwriting styles. We're talking about freeing your creativity, about giving you awareness of the background structure of music itself! Over 10 years of effort in one inexpensive eBook! "I am truly impressed with both the quantity and the quality of the information in "How to write your songs down" by Dainis W. Michel. There has been a tremendous amount of work into this project and the result is a stunningly simple explanation of song writing techniques. I have had an interest in writing down music that I've "made up" since I was very young but until I read Dainis W. Michel's book I could never write it down quickly enough to make sense. His notation method takes all the difficulty away and allows you to concentrate on the melody and rhythm of your piece. I love the way this book starts with doing, it really motivates you to want to do more. Your notation method is extremely easy to use and makes perfect sense. The music clips that come with the book allow you to understand better because you can hear as well as see what is being explained. The exercises in Chapter 4 are amazing too! They really help with counting beats and timing. You can actually feel the rhythm as you do the exercises. The Hands-o-Music on page 59 is such a logical progression from the clock, it's so simple to build on what you're learning. The diagrams make it so clear you cannot fail to remember the techniques. This is a book that you can start at the beginning and work your way through or that you can dip into at whatever point you need help. The clickable links to sections of the book and external sources that help to build your knowledge are so helpful. The thorough research that has gone into the preparation of the book shines through and Dainis' enthusiasm for his subject pours out of the pages. This is a book that I will be going back to again and again. " The eBook is a compilation of methods I've worked out over the years, and it contains, quite literally, information I wish I would have learned much earlier in my career as a composer. I really want to share with you the tremendous feeling of being able to write your music down...some of you may even be on the charts...and still might not know how to write a lead sheet...or at least not a professional-quality lead sheet. I spent ten years figuring out ways to make accessing the language of music easy...and now I can save you the struggle. 2.5 WHY WRITE DOWN MUSIC? 5.5 SING SCALES WITH ME! 12 of which show the modes ionian (major), dorian, phrygian, lydian, mixolydian, aolean (natural minor), and locrian for each key. (Please do not underestimate the increased efficiency and understanding you'll have when you see how simple these diagrams make your understanding of modes). You'll feel like a million bucks! Do you know what it feels like to hand musicians a score...not just a sketched out kind-of-sort-of so-so chart? Let me tell you, it feels incredible. The musicians look at you with a gleam in their eyes, the kind of gleam that means "I respect you for going through the effort of respecing yourself, your music, and me...thank you." When you work with more and more professional folks, you'll get treated like an "equal," like a "pro," because you are the "real thing." Let me tell you, it's an awesome feeling. If you are not 100% satisfied with the eBook "How to Write Your Songs Down," simply return it within 30 days for a full refund. No questions asked. No thanks, just send me the Free Report called "Unleash the Awesome Songwriting Genius in You...NOW!" I promise to use it only to send you our informative and free Music Composition and Songwriting E-Zine. The E-Zine is currently sent out a few times a year, and your report will be sent to you in a few days. Subscribe now and get free reports like "How to get a professional lead sheet out of free software!" FREE. I promise to use it only to send you our informative and free Music Composition and Songwriting E-Zine (which includes juicy, informative, time-saving, and money-making tips)!